Excerpts from: The Mere Living, by Hazel McDonald Parkinson, D. W. Friesen & Sons Ltd., Altona, Manitoba, 1957. A Manitoba farm was truly a happy place for two small girls in the glorious warmth of summer days. As summer advanced and the green fields turned to gold before our eyes, the pace of living increased. Father hitched a team to the binder and drew it from the shed where it had been stored; the canvases were stretched and repaired. Trips to town were made to purchase great balls of binder twine enclosed in jute sacks. The granary bins were cleared of the accumulation of lumber left there during the year. Clean grain bags, neatly mended, were piled in the granary ready for the threshing time. The grain separator and the steam engine of our threshing machine were overhauled. Horses that had been running in the pasture were hitched and driven to condition them for the work ahead. Then harvest began. When we awoke each morning the men would have been long at work, the milking pails and dishes would have been washed and the house below tidied while mother would in all likelihood be baking pies or canning fruit in the back kitchen, where in summer the cooking, baking, washing, ironing and buttermaking were done. After our breakfast we would wander outdoors to listen for the whirring of the binder, and if it were the "front field" in which the men were working we would stand in the lane under the shade of the trees to wait for the binder to pass us as it made its circuit of the field, or watch the men who worked behind it piling the yellow sheaves by tens or twelves upright into "stooks" so that they could withstand the wind and the rain. Sometimes, as a great treat, as we grew bigger, we were allowed to stand on the platform behind the windboard of the binder, holding on securely and watching the golden grain falling before the great moving knife, with its pointed triangular bladelets, onto the table canvas that revolved endlessly about its rollers, carrying the grain to the elevator canvases that dropped it to the grain table. When enough grain had accumulated on the table we liked to jump back to the ground to watch the "knotter" dart out and tie the grain securely into sheaves with the twine that was fed into the needle from its lofty perch near the driver, and watch the tied sheaves fall into the bundle-carrier to be deposited in rows on the ground to await the stookers. We loved to be in the field when it was time to stop for dinner at noon, to see the men unhitch the four-horse team, secure the tugs to the breeching and plod toward the barn where they gave the horses a pail of water from the pump in the passage. Here the men fed the horses their oats and hay and left them contentedly munching while they went to the house for their own dinner. But as harvest day succeeded harvest day our interest waned and we were busied once more with our own affairs, until threshing-time arrived. A steam powered threshing outfit. How excited we were when the threshers arrived! The caboose usually came first, drawn by a team that could be spared from the threshing. The caboose, which accompanied every threshing machine in those early days, was the sleeping quarters for the men. A frame shed, small enough to be fitted onto a standard wagon frame, it afforded little space or comfort to the fourteen or sixteen men who slept in two tiers of bunks built along each of its sides. It had one window at the end and depended for its supply of fresh air, if any, on the open door. To provide against cold nights there was a very small pot-bellied stove near which were usually a few open shelves for the men's meagre clothing. That they did sleep soundly in such a place was no doubt due to their exhaustion after a hard day in the open air. No sooner was the caboose installed than the stook-wagons began to arrive, racing with one another and making a great clatter that was always associated in our minds with the excitement of threshing's beginning. We stood about the back door where benches with basins, soap and towels were placed near a rain barrel, and watched the men splash and rub as they "cleaned-up" before entering the back kitchen. Then supper began. The men took their places on the benches, and great plate of meat and dishes of food disappeared rapidly, alongwith pickles, stacks of bread and butter, hot biscuits, cakes and preserved fruit, accompanied by cup after cup of hot tea. As soon as we had seen the meal well begun by the stook-wagon men, we rushed out to watch the slower approach of the threshing-machine itself. The black steam engine with its plume of smoke had the cumbersome red separator hitched behind it. These were followed by the rack that held the straw for fuel when in transit, and behind this came the horse-drawn water-tank to fill the boiler when necessary. The machine puffed and clanked into the yard, the engine was throttled down and came to a stop, the fire was put out and the whole left until the morning daylight to be re-animated and set up in the first field for operations to begin. For four or five days life was busy and full for everyone on the farm. Sometimes we begged a ride out to the field in the grain wagon, and, alighting near the separator after a bumpy passage over the stubble fields, we ran directly to the engine where we could watch. In reply to our questions "What makes it go?" Father explained how the straw fed into the firebox made the water boil in the boiler, and the steam forced the piston in and out of the cylinder, rotating the fly-wheel to which it was attached by a heavy shaft. This we did not understand very well, but we could see the fly-wheel spin around inside of the wide, heavy, endless, black belt that extended over twenty feet to the separator wheel. When he showed us the short belts and pulleys that were run from the separator's drive-wheel we were again in a maze, but we watched excitedly the men working about the separator each at his own position. 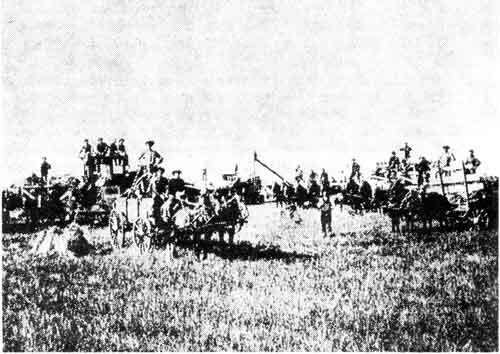 The loaded stook-wagons were driven up on each side of the separator. Drivers tied the reins to the front of the rack, seized their forks and rhythmically forked the sheaves onto the table. Here they were as rhythmically seized by the "band-cutters" and forced into the machine. A series of endless canvases carried the loosened grain into the cylinder of the machine where the straw and chaff were separated from the kernels and all passed onto great screens through which the kernels dropped into a hopper below. The grain was taken from the hopper up the elevator in tiny cups on another endless belt until they were tipped down the long pipe of the "bagger" into the bags held beneath it, or ran directly into the open wagon-box. Meanwhile, the straw and chaff, loosened from the grain itself, were blown out from the carrier tables through the "blower" into great golden stacks. The noise, the hustle, and the orderliness of the whole process was, to our small selves, enormously exciting, but in our early childhood we were not permitted, for fear of accidents, to linger in the field. When the next grain-wagon was filled we were hoisted upon it, either uncomfortably perched upon full sacks of grain, or more comfortably, on the open box full of grain, if that were the method of transportation used at the time. The evenings of the threshing-time were lighted by the blaze of burning strawstacks. From the uncovered front verandah we watched for the first tiny blaze of a nearby stack and were thrilled and excited as the blaze grew to envelop the whole mass. Sometimes, especially if the sky was cloudy and rain threatened to dampen the straw, fires sprang up on the horizon for miles around lighting the whole sky. When strawstacks were burned we were allowed to stay up later than usual to watch the bright fires and smell the straw smoke. The smell of burning straw is a poignant unforgettable experience that evokes in the prairie dweller a nostalgic memory of those happy brightly lighted nights that now, since the advent of combine-threshing is rarely enjoyed. We hated to see the end of the threshing. With the departure of the machine, the last rumble of the racks and wagons, the disappearance of the caboose down the lane and the dismantling of the long table in the back kitchen, we were convinced that threshing was over for the year, and there was a fine withdrawing of our family within its own familiar circle.